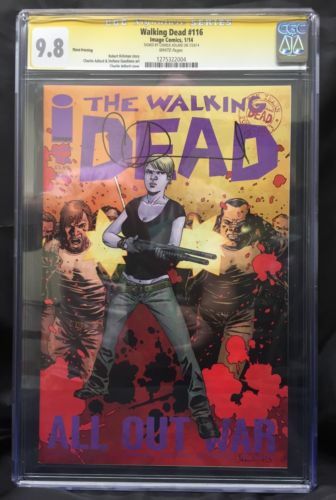 The Walking Dead #116 Third Print CGC 9.8 Signed By Charlie Adlard VERY RARE! This issue was printed but never officially released by Image Comics. This issue may be limited to just 25 in the world making it the rarest Walking Dead comic in print. This was supplied to us by Charlie (Adlard) at the same time as receiving the 1st and 2nd prints. When Charlie was siging them he noticed the difference in colour. It was following this that we noticed that they were 1st, 2nd and 3rd printings. We initially listed these on ebay but were asked to remove them as comics had not been officialy solicited. The 2nd print went on to be released but not the 3rd. We since have had them CGC'd to authenticate its existence. Will only be sent by courier trackable service with signature service.